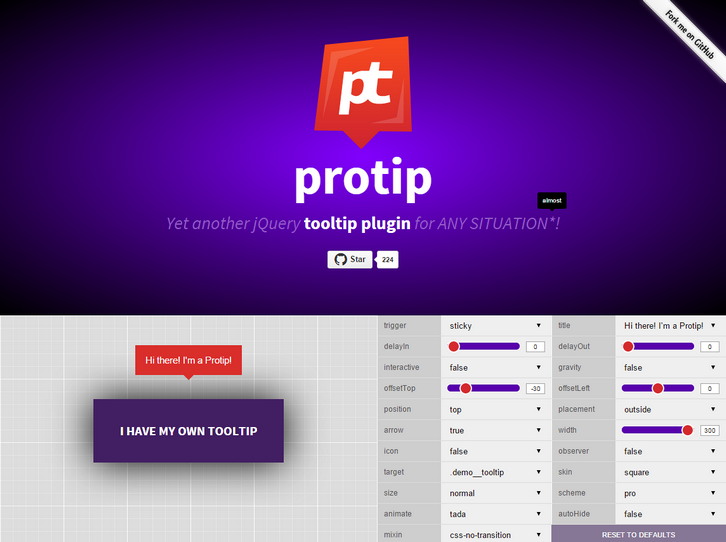 Protip is yet another jQuery tooltip plugin for any situation. It’s not so lightweight but it doesn’t intends to be. We needed a solution which can fit into every scenario we face with. It supports 49 position, Live refresh of tooltip options, Live element checking, Gravity, DOM targets, Placements, Click activated and sticky tooltips, Custom HTML content, Interactive tooltips, In/Out delays, Auto-hide, Icon support, Skins, sizes, schemes, Animations support, Mixins, Custom event callbacks and UMD Support.